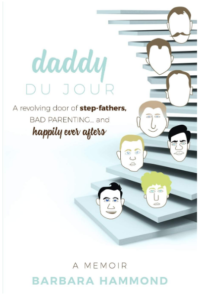 Today, a sample of an intriguing memoir daddy du Jour (available on Amazon) from Barbara Hammond. Book Description: This is a book about survival in many ways. Barbara became the primary caregiver of her younger brothers at an early age. There was a revolving door of men in her mother’s life. Some were good; some were not. Her favorite stepfather introduced her to the man she’s been married to for more than 50 years which proves how living in chaos can sometimes lead you to the other side. That’s a happy ending. Marvin and Lora’s home was lovely and warm but nothing as special as the home I stayed in for six months when I was five. My mother married Al the year I turned five. I liked him very much. They met at the factory where they worked. We lived in a small one-bedroom apartment over a garage in town. I’d slept on the pullout sofa since he moved in. Kindergarten wasn’t required back then. There wasn’t even a kindergarten class available in the public school we lived near. I was an avid fan of books, Captain Kangaroo and The Mickey Mouse Club. I knew about school and couldn’t wait until I was old enough to go. It was disappointing having to wait another year. Then something wonderful happened. Mom and Al were switched to 3rd shift. Working 11pm to 7am meant taking care of a 5-year-old was going to be a problem. I recall lots of discussion about what to do with the kid. I don’t remember many of the details, but this became life altering for me. Apparently, my great Aunt Barb’s sister-in-law and husband, who were probably in their 60’s, offered to take me in. I had never met them, and neither had my mother. I loved Aunt Barb, who I was named after. She was Mamaw’s youngest sister. We didn’t get to see each other often since she lived in Georgia, but whenever she was around it was fun. Everyone agreed it would be fine to move me out to the country. It was one move I have never regretted. There was a bit of culture shock when I first arrived. The yard was open and green. I had never had a big yard to play in. Even my grandparents lived in the city then. Minnie and Delmar’s house was beautiful inside and out. I was afraid to touch anything. It wasn’t palatial by any means, but so pristine and inviting. There was a vase of flowers on the kitchen table. They must have come from the beautiful flower garden I’d seen next to their driveway. I could smell fresh coffee and the wonderful aroma of warm muffins. A clock on the living room mantle startled me when it chimed on the hour. I grew to love that chime. It took me about two seconds to fall in love with my bedroom. It was the most beautiful bedroom I had ever seen, and it was mine alone. The house was a Cape Cod style, and my room was up under the eaves. The ceiling sloped on both sides, and there was a nice-sized window at each end. There were twin beds, so I alternated beds for a while until Minnie told me I had to choose one because she wasn’t interested in washing extra sheets each week. I complied. The biggest shock was my first breakfast there. I was used to making my own cereal or just sitting in front of the TV eating dry cereal out of the box. My mother wasn’t a morning person and that never bothered me. I woke the first morning to the smell of coffee and something else that made me salivate… was it pancakes? I ran downstairs and stopped dead at the kitchen door. The table was dressed in a pale yellow cloth, beautiful flowers were in a vase at the center of the table and there were 3 place settings. Each place had a small glass of orange juice, a plate, silverware and a cloth napkin. Wow. I’d only seen something like this on TV. Minnie was humming at the stove; Delmar was sitting at the table holding a chair out for me. I halted before I walked in and sat down. Was I dreaming? The entire scenario was a beautiful assault on my senses. The only problem was the missing coffee cup from my place at the table. When I asked for one, they were shocked. “Oh honey, you’re much too young for coffee!” Minnie said. I informed her that I’d been drinking coffee since I was two years old and would truly love a cup right then. She wasn’t going to relent, but Delmar gave her a little nod, and she asked me what I’d like in it. I showed her how my grandmother fixed it for me. She relaxed a bit when she realized my idea of coffee was primarily coffee-flavored sugary milk. I sat down next to Delmar and waited for the pancakes. I watched him place his napkin on his lap and I did the same. I’d never used cloth napkins before. Then Minnie brought a large plate of pancakes and placed them on the table. I wanted to reach for the pancakes, but I waited. They bowed their heads and gave thanks to the Lord for the meal. I did the same, and we all said, “Amen.” Then she took my plate and asked how many pancakes I would like. I asked for two even though I was pretty sure I could eat more, I didn’t want to seem rude. She assured me I could have more. As I stuffed my face with pancakes, Minnie told me they were going to get me registered for kindergarten that day. Then I knew I must be dreaming! This was amazing to me. You can’t imagine the sheer joy I experienced in less than 48 hours. I was on cloud nine! The kindergarten was in a two-room house in the back of a larger elementary school. There was a playground between them, and we had our own separate time to use it right before nap time. I had never been good at napping, but after the fresh air and outdoor games, I learned to enjoy it. We only had half-days, but they were packed with fun things to do. I loved the coloring time and music too. Minnie would walk me to school in the morning and would be waiting for me when the bell rang. We would talk about my day and hers too on the walk home. Sometimes we would stop to visit with her neighbor, Sally, who was quite a bit older than Minnie. Her house was cluttered and stuffy, but the smell of fresh baked cookies always drew me in. The six months spent with those lovely people made such an impression on me. It was impossible not to compare what I’d known and what could be. They gave me hope for a better life–a standard to aspire to. I am forever grateful for them. I was able to visit them occasionally after I left. It was always a pleasure. I believe they gave me my love for flowers as well as the desire always to make my home warm and inviting.